What happens when the lifeguard is unable to save the girl? The sky broods in a dark, violet mood before it lightens, grudgingly, for the dawn. After a bit the sun rips it apart, glaring down on the beach below. The fiddler crab scurries across the soft sand while its larger cousin scuttles into deeper depths. Low over the water the gray-tipped sea gull soars, head cocked and eyes sharp, looking for the slightest sign of breakfast beneath the waves. And then there is a new sound: a singing of the sand that runs down the length of the beach. The resident creatures do not concern themselves; they have heard this song before. Slowly it becomes more and more audible, and then its source hoves into sight: a shiny red lifeguard truck filled to the brim with young men and women preparing for a day of protecting foolish tourists from their own folly. The truck comes softly to a stop, and emits a single lifeguard, complete with flag and buoy and lunch bag and towel, before it moves on. Then it passes swiftly into the distance, out of sight, taking with it its song and leaving only the drone of the sand fleas and the rush of the living waves as they fall softly over each other in their effort to touch the sand. Then there is a succession of soft chinks as the flag and buoy, lunch and towel hit the sand, and the soft, crunchy footfalls of the lifeguard as he plods toward the observation tower kept in the dunes at the back of the beach. The morning sun casts long shadows ahead of him which finger the orange tower long before he himself gets there. But he is patient, he does not hurry; time itself ensures that he will reach the artifact and he does. Then, lift! and it is on his back, being dragged toward the water's edge. He places it carefully so the baby waves can just tickle its feet, then fetches the flag and buoy and places them in their respective holders. His bag lunch and towel are thrown into the seat, and then he hoists himself up into it, and, resting for the first time this morning, looks out over the sea. A massive sob grows within him, but, with effort, he suppresses it. The giddy waves continue their eternal fall. He curses the can of beer that washes onto the sand beside him. "Hello," she says, and he jumps. He had counted on at least a couple of hours before he would have to face anyone. "I said, 'Hello'," she repeats. "Don't you say 'hello' to people?" "Hello." She is wearing a long, brightly-colored skirt over a white blouse, and is very pretty. The guard smiles a little. He considers a facetious reply; after all, there is a Red Cross patch on his baggies and a whistle around his neck; and he is sitting in the lifeguard tower. But he controls himself and answers simply, "Yes. Yes, I am." The girl smiles strangely to herself. "Funny, isn't it?" she murmurs, and then, more loudly: "May I sit on your tower?" Too late, he realizes that he is not sitting on it, but is standing next to it. "It's against the rules," he says, but she climbs up anyway. "I've always wanted to sit in a lifeguard tower," she remarks. "Do you have any girl lifeguards?" "Yes, we do," is the reply. "Women's lib saw to that, I suppose. You can see the whole ocean from here," she adds. "And this beach! It's so desolate-looking—in a lovely way, of course." Gracefully she drops from the tower and steps a bit away. "Desolate," she continues, "just like a graveyard. Or the moon…"
He is gazing out at the glaring ball of light that is the sun and notices for the first time the full moon beside it. How balanced they look beside each other, he thinks, wondering how long it has been since last he saw—and then his heart chills. A full moon can't be seen in the sky next to the sun! "It beckons," she is saying. "The moon beckons…like the beach, its beauty is in its desolation…" She is speaking dreamily, to herself, as the reflection of the moon's wake on the silver water becomes brighter. It almost seems as if one could walk on it, right to the moon itself. "Come with me, lifeguard," she says, stepping upon the silver path. He is confused. "I—I can't leave my post." "Oh, come on!" She is playful, yet insistent; she takes his hand. She is standing on a small hummock about three feet above the general ground level. The landscape is pockmarked with meteor craters of every size and description, and the unwinking stars burn unceasingly in the ebony sky above. It is only a whisper that slips from the guard's parted lips: "My God." "Welcome to my garden," she says prettily, curtsying. "Garden?" says he, still stunned. "There're no flowers on the moon." She laughs. "Oh, I always have flowers with me." The flowers are exquisite, red and magenta and black, strewn across the lunar landscape as far as the eye can see. Music fills the air with the sweet scent of melody as the couple wanders along stony paths. The girl is even more joyous than the guard is astonished. "You know," she ventures, "how sometimes you just have to sing?" "Yes, you know!" she says, and takes his shoulders. "You realize that your life has been so wonderful, like, like a movie musical and you just have to join in…no matter how sad the ending may be…"
She opens her mouth in song, but the guard sees only the smooth surface of the path ahead. Smooth?—it has been rocky everywhere else, but—! It is too late; their feet are already churning into the quickdust. The shadows meet their feet but there is no resistance; the slippery particles let them pass on through. The girl's song becomes a cry of surprise as they drop, slow motion, into the abyss beneath. They fall to a concrete floor, accompanied by clouds of the blinding, slow moving dust. In the light gravity the fall is not severe and the guard shakily rises to his feet. "Where are we?" he asks. The girl looks around her. "I don't know." They are surrounded by clicking banks of machinery, equipment accomplishing no obvious purpose. It extends to the limits of vision, in every direction. The guard squints at the tubular light sources overhead; the hole through which they entered cannot be seen. "Listen," he says, struggling to keep his voice quiet, "this is your, uh, place. I have to get back to my tower." The girl is not listening. "Look!" she cries, pointing to a certain piece of equipment. The guard complies and fear again touches his heart: a pulsating globe of light has emerged from the device and, after hovering in the air a moment, has begun to drift toward them. His reasoning gone, he pulls the girl to her feet and the two run in the opposite direction. Around this piece of equipment and that, anywhere so that the alien creature cannot find them. They reach an open space and pull up short. Their running has been in vain; there are more of the light-creatures there, waiting for them. They have been herded. The guard decides to attempt bravura. "Who are you?" he demands, but the blobs ignore him. They seem to take position around the girl, their "voices" echoing in the chambers of his mind. "We sentence you to death," is the thought. Death? He can't believe it; it makes no sense… "You can't kill us!" he exclaims; a beam of light is projected from the nearest blob, knocking him into one of the equipment bays. Sparks fly. "You were not spoken to, entity," is the accompanying thought. The globes move in on the girl, from whose throat issues forth but a single cry before beams flash from each of the creatures and, with the sound of squealing brakes and the smell of burning tires, she vanishes. The guard is frozen with horror. "No!" he cries. Silently, the globes float away, leaving him alone in the vast chamber. "No!" "Well, look," says the driver of the lifeguard truck, "if you don't want any water, you don't have to have it." "What?" gasps the guard. "Oh, I'm sorry—I—I had my mind on something else…"
"I'll say you did," the driver smirks. "I will have some water." The guard lowers himself from the tower as the driver gets out of the truck's cab; they meet at the back. The driver opens the water cooler, exposing the dancing liquid and bobbing ice to the hot morning air. Carefully the guard pushes the communal soda can under the surface to fill it with the cooling stuff. "Hear you went to the city yesterday, hunh?" says the driver, to make conversation. The guard nods, sipping thirstily. "I need to go there soon myself," the driver continues. "Need a new pair o' shoes. I could get 'em here, I s'pose, but I like to look at the girls in the city. Didja see any girls when you was up there?" The lifeguard chokes on his water. The driver guffaws. Did, huh? Oh, I remember. You fool, you got engaged, dincha? Well, you might be goin' ta get married, but ya ain't dead yet, know what I mean?" He digs the guard in the ribs with his elbow, nearly knocking him over and causing him to choke again. "Well, I got to go," says the driver, looking around. "This's the loneliest beach! I like lotsa people around… 'specially the girls." The cooler closed, the driver reenters the truck and starts the engine. "Well, so long. Got other guards to water." And, accompanied by the singing of the sand, the truck is gone. The beach is a world with the tower as its center. In other places the guard feels that he is the center, but here, everything focuses on the tower and the orange flag that flaps relentlessly over it. Besides, today he doesn't particularly feel like a lifeguard. The gray-tipped sea gulls search and dive, search and dive. Who can tell when breakfast stops and lunch begins with them? They simply dive on anything they see moving, and, in their hunger, kill it. Angrily the guard knocks down the tower, the bamboo flagpole describing a sweeping arc before slapping the sand and sea which blur before his eyes as great, choking sobs erupt from his chest. After a while the guard re-stands the tower. He gazes hungrily at the playful waves on the water and runs into the sea, the cold splashing his toes and then his ankles, moving up to his shins and knees until they no longer hold him upright and his speed forces him to dive cleanly into a frothy white breaker and emerge, as the gray-tipped sea gull dives and emerges with breakfast. Dive and emerge, dive and emerge, the cold-tumbling waves batter the body of the guard until he is broken and bleeding. He skids across the concrete, small pebbles tearing at his flesh like claws. The gray wall lies ahead and his progress towards it is unchecked—faster, spinning—and he breaks the surface and descends to the cool depths beneath. All around him is the ballad of life and death, for such is the song of the sea. But it is a purposeful melody, a profound tune with a delicacy to its ferocity, a glad-making to its savagery obvious to anyone who would look. He lifts his feet high to clear the water with each step that brings him closer to the tower on the beach. The girl is just behind him, the gay colors of her skirt wetly intensified by the waves. "Why do you love the water so?" she inquires, a trace of awe in her voice. "Huh?" says he, turning. "Aw, I just dig it, I guess." The search for words, for meanings, is tiring and he continues the wade to the tower. "No, that's not it," the girl disagrees. "When you're upset you run into the water, as if it could cleanse you emotionally as well as physically." By now they have reached the tower and the guard dries himself with his towel. Done, he offers the cloth to the girl, but somehow she is dry, the gay colors of her skirt quietly brightening their part of the beach. "Where did you hear that?" asks the guard, laughing uneasily. He pauses. "You have a lot of insight. Have you ever thought of becoming a psychologist?" Now it is he who is making conversation, but the girl is pleased. "As a matter of fact, yes!" she beams. "That's what I'm studying for in school." She shakes her head thoughtfully, adding, "So many people need help these days. Oh, I don't mean the out-and-out crazies; those are for the psychiatrists to handle. But the ordinary people with problems with which they just can't cope—those are the ones I want to help." She draws nearer to him and, gently, touches his suntanned cheek. "I can help," she says earnestly. "What is the shadow on your soul?" Peering deeply into his eyes, she adds hopefully, "Discussing it will bring it out into the open…"
The guard backs into the tower. "Nothing," he says huskily. "No shadows…"
The girl is insistent. "But there is something troubling you." "Nothing," he says. "I'm O.K." "A darkness on your soul," she continues, unrelenting, "an eclipse of fear and worry over your heart…"
"An eclipse," shouts the guard. "It is! Look!" All motion on the beach seems to come to a halt as attention is focused on the celestial phenomenon over their heads. "I didn't know there was going to be an eclipse today," remarks the girl in a puzzled tone. "Neither did I—but, then, I hardly ever read a newspaper." The sea gull is puzzled and the fiddler crab scurries for his nocturnal shelter as the cruel sun is obscured by the lowering disk of the moon. A sudden chill descends on the beach that intensifies the falling of the waves until they make a roaring sound that overcomes all else. The breakers fall white against the inky black water and splash onto the pink-sanded beach beneath the heavily-starred and auroral-curtained firmament. The girl's voice is a whisper against the backdrop of nature gone mad. "What is that strange glow in the sky?" "It looks like the Aurora Borealis—the Northern Lights—though I thought we were too far South to ever see that." "Everything looks so different when you look at it this way—!" The two walk up the once-familiar beach, marvelling and shuddering at the change. They do not realize how extensive that change is until they reach the dunes, and look out over what should be acres of sawgrass and low palmettoes. "My God," whispers the guard. Before them lies a tremendous desert of green and red cinders through which runs a river of molten lava. The sky is beginning to streak with the trails of shooting stars, and an odor of sulfur is in the air. "What's happened?" the girl whimpers. "This wasn't here before." Behind them, the Earth itself seems to groan in agony; the guard and the girl whirl around in time to witness a jaded fissure ripping across the beach, attempting to separate the two from the ocean. The girl screeches hysterically, "Oh! Oh! It's the end of the—" She is interrupted by the crashing to Earth of a small meteorite just before them. "What is that?" asks the girl. "Shooting star—a meteor!" There are more, and then the air is filled with the heat of the falling objects. "Somehow—this is a meteor shower! We have to find shelter!" "But there's no shelter at the beach," she protests. The guard points to where the fissure has not yet reached full width. "If we hurry we can reach the lifeguard tower, hide under it—let's go!" He begins to run, but the girl is not behind him. She has picked up one of the fallen stars and is staring at it. "Are you crazy? come on!" the guard shouts. "I thought shooting stars were bits of rock from space." "They are," says the guard. "Hurry!" "Look at this." She holds out the fallen star—and it is a model automobile. Dropping from the heavens, all around them, is a rain of plastic cars. One hits the guard on the head and he staggers, but regains his footing. "Come on!" Ivy-colored clouds of steam are issuing from the fissure as the guard and the girl approach in their desperate race for safety. At the edge of the crevasse the silhouette of the lifeguard tower can barely be made out through the blackness. He leaps over the crack in the ground and offers his hand to the girl, but before she can take it widens. The guard yells, "You'll have to jump!" "But I can't jump that far," protests the girl. The fissure widens further. "You could've if you'd jumped then, instead of telling me you can't," says the guard bitterly. "Now it's too late for that, but at least grab for my hand! If you can't leap across, I'll pull you out." The roar of the waves has been ever increasing in intensity; now it all but deafens the guard's ears. The girl falls sobbing to the ground; the guard glances behind him at the source of the noise and nearly cries out himself. A white wall of water, higher by many lengths the guard's own height, is approaching at express-train speed and when it hits the lava in the fissure—! "Get up, please," he begs. "A tidal wave!" The wave strikes with stunning force, knocking the guard roughly against the wooden beams of his tower. Salt water fills his eyes and ears and nose and then recedes, leaving him dampened and dazed at the rising of the tide. With a stab of guilt the guard sees the lifeguard truck pull up, sees the face of the driver darken. The driver helps the guard pull the tower to the shore and retrieve the flag and buoy. The guard fishes out of the water his bag lunch and towel and puts his belongings back on the seat. "—tide come in, man, you've got to watch it. You could get kicked out of the Lifeguard Corps for falling asleep on duty." (Yes, sir?) The driver eyes him. "You sure been actin' funny today." "I'm O.K. I've just got a lot on my mind." The driver slamcloses his door. "Yeah, well, just see to it it don't interfere with your work. You should be like me. I don't never let my mind get in the way." And he is gone. His mind you could see through, the guard thinks. Like a window. The heat of the day adds energy to the bubbling molecules of the sea and they escape, free to fly into the atmosphere. There they gather and form huge, lumbering clouds that sullenly survey the world below. Her voice drifts on the seabreeze to where he is now standing. "Lifeguard! Lifeguard!" "What is it?" he yells back. "Come on up! I want to show you something!" The guard hesitates, then trots to where the girl is standing, skirt blowing in the ocean breeze. He looks at her questioningly, but she points to the other side of the dune. "It's all ours," she says happily. There is nothing as much open and, simultaneously, closed as a mountain valley, such as the one the guard sees stretched out before him. It drops off from the sand dune at his feet and falls away over sweetly-scented pines and white-tailed deer and caterpillars typing their appetites on living green leaves. But the guard stands firmly on the beach, warm sand between his toes and the gray-tipped gull overhead. He will ask. He is shaking with the intensity of feeling that has brought him to this, but she laughs merrily. "Last one to the bottom is a rotten egg!" She leaps off the dune and runs breakneck through the underbrush; even at a distance he can see the exposed root over which she is going to trip. Almost without thought he plunges after her, while somewhere in the crash and thud of foot against forest a window is heard to close. Whiplike branches reach and scratch like seagulls pulling at a dying crab. Rocks underfoot bite viciously into his bare feet while thistles and thorns rip at his arms and legs. "Stop!" he yells. "Stop!" —and I ran away, he thinks. I ran like a goddamned chicken, and, God, I hate myself. God, I do. The girl stares sightlessly through the leafy canopy above as the guard lifts her gently. She makes no move, takes no breath. "No!" He plants his feet firmly in the sand and stares at the waves. I might have saved her, he thinks. I don't know that she died instantly. He listens, but there is neither echo nor answer, only the whisper of wind through the trees and the faint rush of tumbling waters from other side of the window. "Doesn't anyone care? Anyone?" But there is no answer, neither the cry of the gray-tipped gull nor the call of the hawk. "Please!" he cries, and falls back, backwards, splashing heavily into the water of a tropic lagoon, disturbing the rest of a one-legged heron. He begins the swim towards the waters edge, burdened by the harness he wears. Standing in the canoe he is towing, the girl firmly brandishes her whip. The guard flinches; the welts on his back stinging like jellyfish tentacles. "Well," she says, "get going! You can't expect to stop and chat, not when we're going upstream." He looks her firmly in the eye. "You won't hurt me," he says, pulling the canoe to him via the leash. "Stop! What are you doing?" The guard is in the canoe; he breaks the harness from his neck with a single snap. His hand is on the whip in a moment, but she doesn't resist and it is easily taken from her. He tosses it into the water. Her look of amazement becomes one of agony and she collapses, sobbing, onto the floor of the canoe. The guard tries to maintain his indifference, but the concern that crosses his face mirrors that which he feels in his heart and he bends down to the girl. "All right," he says brusquely, "What's wrong?" "Nothing," chokes the girl between sobs. "You're not crying for nothing," the guard snarls. She looks up into his face. "I should have killed you when I had the chance," she says evenly. "You know why! You say you're not responsible. You say it—but you don't think it. And neither do others think it!" He begins to protest but she is ranting now and can't be stopped. "You say you're not responsible," she says. "If you're not, you're not human—for everyone on this planet is responsible for his own actions. Not responsible? Take that—and that—and that!" And, although the whip is now at the bottom of the lagoon, the guard feels its lash bite across his chest, sees the blood trickle from the scarring wounds. "That musta' been one hell of a Portuguese man-o'-war. Don't see how you coulda swam inta it. Don't you ever look where you're goin'? Hey, boy," the driver adds, "you O.K.?" "Yeah, yeah," the guard replies. "That ammonia just burns, that's all." "Not as bad as that man-o'-war did, I betcha," the driver chuckles. "There's a lotta them around today. That's why there aren't many swimmers, I guess." He breaks open a tube of ointment and begins to apply it to the welts left by the man-o'-war's tentacles. "Durned if this ain't the loneliest beach I ever seen, though." The driver closes the caps to the ammonia and the ointment and replaces them in the first aid box. "Well," he says, "come on." "Come on?" the guard blinks. "Where?" "To the shack, of course," the driver replies. "You don't expect us to leave you on the beach after that sting, do you? Anyway, it's time for your lunch break." "I'm O.K., really. I'd rather stay here," the guard insists. "I brought my lunch." The driver frowns. "I dunno…"
"Really—I'd rather eat lunch here." Alone, again, with the seabirds and snails, the guard climbs into his tower and pulls out a sandwich from his lunch bag. It is soaking wet from its earlier plunge into the sea; he wrings water from it and casts it aside. Like puffy gobs of cement the clouds have been building and now a groan of thunder rolls over the afternoon. Rain falling on the sea is decorated by a multi-hued rainbow, reflecting the sun's annoyance at being thus mocked. He drops to the sand, liking the sensation produced by the sudden stiffening of the ground as his weight hits it, followed by its softening when he releases the pressure. Idly he traces the outline of a car with his toe, then stands back and inspects it and the rainbow reflecting on the wet sand around it. "I wish I were a rainbow," she says. "A rainbow?" the guard sighs. "Why?" The girl smiles to herself. "So I could wrap my arms around the whole world and keep the rain off." "Oh, you know, being able to protect the world from sorrow without becoming involved in it, myself. That's the problem, today," she adds, laughing at herself, "people being afraid to get involved." "There's supposed to be a treasure at the end of a rainbow," he says lightly. "I disagree," answers the girl thoughtfully. "I think the treasure is the rainbow." It has been growing, this suspicion of the guard's, but now it has come to fruition and the question must be asked. "Are you," he phrases carefully, "God?" She is properly surprised, and gives an improper reply. "Why do you ask?" "I can't control—" he starts, then changes his mind. "You seem so far above everything," he begins again, finishing, "like you weren't of this world…"
The girl wanders to the other side of the tower, runs her fingers lightly over the white-painted buoy, the rough hemp rope. "I was 'of this world' once. It didn't work out, I guess. But—God? No, I have a long way to go before I shall be God." His eyes brim with the tears of pointless frustrations, of guilt, of the impossible promises surrounding the astral girl whose body glistens only in the unlight of his mind. "Do you love me?" she asks. "No, of course not!" he replies, too intensely. "Why should I?" "Why shouldn't you?" she counters. "I'm everything you want in a woman. I'm pretty, intelligent. You can't 'control' me… and I know you." "This is ridiculous," mumbles the guard, blushing. "I can't be in love with—"
"Why can't you love me?" the girl demands. "Because," the guard chokes, "you're hit by a car!" "What?" Barely in time the guard gives the girl a shove, knocking her out of the path of the oncoming vehicle. It hurtles past her, leaving imprints deep in the sand that come close, but do not touch, her prone form. "Why did you do that?" she demands. "And what makes you think I wanted it saved?" The guard stares at her. "Do you think everyone shares your values?" The guard still has no answer, his horror mounting as she continues, "Death might be an interesting experience. It might even be fun to die, to see what else there is besides…this…"
"Don't talk like that," the guard begs. "Please—you mustn't think about dying. See—you're alive. Enjoy it! Don't think about—please—"
There is open hostility in her eyes as the girl faces the lifeguard. "I'll think about what I please, when I please. And where I please—and 'where' is not here!" "Wait!" the guard cries, but it is too late. She is gone, her footprints leaving imaginary testimony of her tenuous existence. In spite of the storms hanging over the eastern horizon, the sun is hot overhead and it welcomes the beachgoers who arrive to take advantage of this particular beach's desertion, to delude themselves with dreams of "getting back to nature" while insulated from it with suntan lotion, polystyrene coolers, 8-track stereos. They drive over the living shells, drop Coke cans and Polaroid picture peelings on the homes of the subterranean sand-dwellers, fill the air with their shouts and screams of merriment and of agony. The lazy hours roll by, oblivious to the desecrations by the group on the beach. A man paddles out on an air mattress, then finds, when it deflates, that he can't swim. A child encounters a Portuguese man-o'-war and must be anointed with ammonia and anesthetic salve. People ask questions about the sea, and the beach, and the tides. And, through it all, the clouds pile one on the other, enormous piles of dirty cotton that obscure the sun and breathe a chill on the air. It looks like quite a storm is brewing, and in a rush of activity umbrellas are folded, hibachis are stowed away and, once again, the beach is deserted save for the orange tower and the two figures standing beside it. "Do you think it will snow?" she asks. "Not this far South," he scoffs. "It'll rain, though." "First rain, then the snow," she agrees. The raindrops begin to fall and the two duck under the tower, sitting on the rear leg support, looking moodily out on the Ravelian seascape that is framed so neatly by the front legs of the seat. "Will the lifeguard truck come and pick you up, now?" the girl asks. "I don't know," the guard replies. "I guess so." The foaming sea waters drop over themselves in their eternal effort to reach the shore, oblivious to the pockmarks imposed upon their surfaces by their skyborn brothers. "What d'you suppose," the lifeguard begins softly, then catches his lower lip. "What d'you suppose it is like to die?" "I do love the water…the sea…"
He notices that she is no longer with him, and, again, looks seaward. Half-a-mile out, she is there. In a moment he has thrown his flag to the ground, a signal that there is an emergency. The buoy is in his hands, the rope around his neck and shoulder; he is clearing a white-walled path through the waves until he can walk no further. Then, dive! and swim, over small waves and through larger ones until—but it is too late. She is nowhere in sight. His lungs reach the bursting point; struggling is useless. The guard knows that he should let the rotating waters take them down as far as they will, after which they will be ejected to the surface. But can he hold his breath, stay conscious for that long? The desire for air becomes a burning point beneath his chest; somehow, below he makes out the hazy outline of an underwater city. There the couple is pulled to a strange, multi-level platform. The grayness of the water has dulled to pink, and turbulence occasionally distorts the guard's vision. The guard tries to speak but can only gurgle. KNOWEST YE NOT WHERE YE ARE? Milton's gate rises before them with its engraving of despair: "Abandon all hope, ye who enter here." at the guard. Frantically he flails his arms to swim from her, and to the topmost platform. His head feels like lead and his eyes are heavy, so heavy. Each beat of his heart threatens to loose that organ from its moorings, and the beats are pounding closer and closer together. His head drops down again while he savors the taste of fresh air on his salt-encrusted tongue. After a while he lifts his head for another breath, and another, and then another, finally rolling over and feasting on the life-giving air. His chest quakes, both from exhaustion and from hysterical laughter. A lightning bolt rips through the sky, unleashing another torrent of rain. The guard struggles to his feet to the tune of steady thunder, staggers, and stands. A second finger of lightning hits the lifeguard tower; all that remains is a smoldering, blackened skeleton. He raises his arms helplessly to the heavens, letting the rain fall on his face. Behind him the lifeguard truck approaches, its top-mounted red light flashing in electric anger. The girl approaches from the beach, brushing against his arm. She stops, as if confused about her bearings; then she notices the lifeguard. "It's the police!" she cries, panicky. "They tried to stop me from going last time—but no one can stop me now!" She begins again to run towards the water but the guard has grabbed her arm. "What are you do—?" he begins, but she breaks away and splashes into the sea. The truck has come to a stop; the cab disgorges the driver and another man in uniform, a policeman who suddenly seizes the guard by both arms, from behind. "Listen, buddy," the driver begins, "this guy says—"
"I'll do the talking," interrupts the policeman. "Your car has been identified as being involved in a hit-and-run acci—"
"Later!" The guard tries to pull away. "There's someone drowning out there!" The cop pulls him back roughly. "None of that crap, kid!" The driver is more duty-conscious. "Where?" he asks, already scanning the gray waters. "Straight out there," replies the guard desperately. "See her?" Peering through the raindrops, the driver sees nothing but endless ocean. "He's just shittin' you and you know it!" snarls the cop. "He's a born liar who'd hit and run a poor defenseless—"
"Let me go," the guard cries, "she's drowning!" "The cop spits. "Liar!" The rain is streaming down his plastic visor. "He's been actin' strange all day…" the driver begins to explain. "Please let me go," the guard begs, still struggling vainly to extricate himself from the cop's vise-like hold. The driver is becoming suspicious. "…like maybe he was on one of them narcotic trips…"
"Drugs?" The cop nods. "He looks like a dope-head to me. Probably stoned when he ran over that girl, too." Far out, beyond the breakers, the guard can see the gay-colored form of the girl splashing helplessly. "Please let me go!" he pleads, his voice catching. "She's drowning! I—I promise I'll come back!" The driver is facing the guard squarely, all but blocking his view of the sea. Now he stands, rubbing his right fist into his left palm. "Well," he says slowly, "we don't like dope-heads in this lifeguard corps…"
And then, like the strike of a cobra, the driver punches the lifeguard in the stomach, doubling him over. "Oof! What're you doing? Let me go!" The guard struggles, but the cop is holding him more securely than ever. The driver brings his fists together under the guard's jaw, snapping his head back into the cop's chest. "God!" sobs the guard, "Please let me go! I have to save her!" His mouth is pouring blood, and yet still the driver comes at him, pounding him in the gut and in the face again and again. The officer lets go and the driver's next punch sends the guard crashing into the side of the truck. He is moaning and lacks the strength to rise. When he opens his mouth, more blood leaves it than voice. "Please oh God save me save her oh God dear God…" The useless litany continues but there is no force behind it. The radio in the truck beeps; the driver bends through the window to answer it. "Yeah?" "Hey, lissen," squawks the pre-teen voice of the dispatcher. "I got a message for the guard at Crescent Beach." "Yeah, well be careful how you break it to him. There was a hit-and-run accident in the city last night and a girl was—"
"Yeah, I know about that," interrupts the driver. "Well, here's the message: they finally identified her body. It was his fiancé." 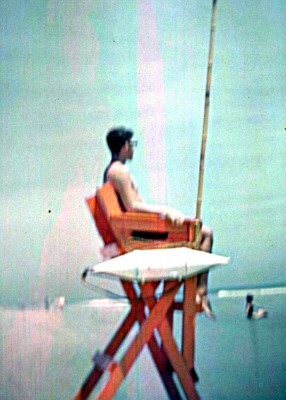 The driver pulls out of the window and stares at the crimson-and-white form of the lifeguard. "You goddamn son-of-a—" His hammy fist connects one last time, utterly crushing the features of the unconscious guard. The rain erases the footprints, the tire tracks, the bloodstains from the sand. The potato chip bags and flashcubes are washed into the ocean, to be hidden by that blanket of gray from the sight of men. It is as it has always been for untold thousands of years, as if no human has ever been here. The rain stops. The gentle snow begins. The screaming ends. When I submitted this in a creative writing class, the teacher took me aside and told me I was "too close to the story" and should probably wait for the pain to die down before I tried to re-write it. Apparently, she thought this had really happened to me! By the way, this is not supposed to be humorous. In case you were wondering.